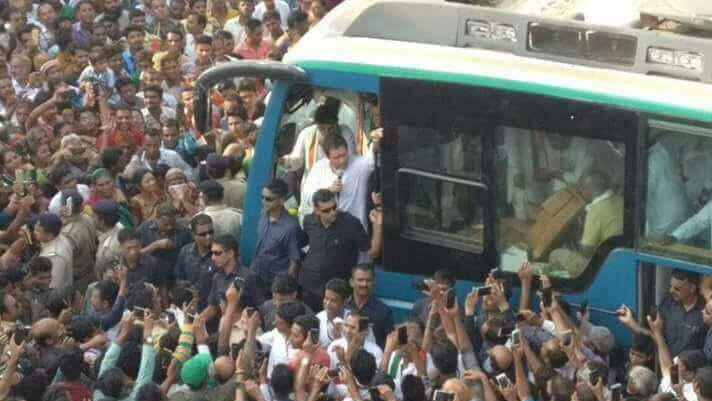 Even as Congress vice-president Rahul Gandhi this week completed the second leg of his whirlwind visit to Gujarat ahead of the state assembly polls, to be held in December, all eyes are set on whether the party, which got 38.9% votes in the 2012 polls as against the BJP’s 47.9%, would be able win over the huge crowds Gujarat's Congress leaders had mobilized for him. Despite Congress being upbeat, as seen in their postings on the social media, especially the photographs of Gandhi amidst thousands of people on streets, and on atop two sides of buildings, senior party leaders doubt that the "tide" would, if at all, turn for the Congress. 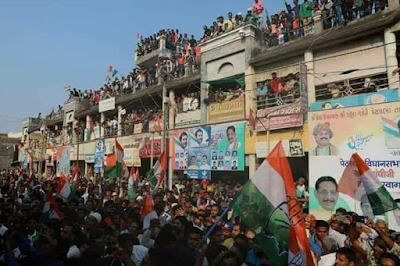 The reason, they opine, is simple: Despite discontentment among city middle classes, traders and small entrepreneurs, who have been the BJP's traditional base, the Congress' presence in the urban areas remains in the margins. In fact, a senior Congress leader, who is also a Rajya Sabha MP, and is said to be close to party chief Sonia Gandhi, has been going around posing a straight question to those very close to him and claiming Congress would win this year's polls: "Tell me where is Congress in urban areas?" The Congress leader, who was in the past the main brain behind the party's campaign for forest land rights in Gujarat's eastern belt, has been quoted as saying that the 182 seats of the Gujarat state assembly could be divided into three parts. "One third these of the seats, about 60, are in the urban areas. Almost all of them would go to the BJP." "Of rest of the about 120, one had divide them 50-50 between the Congress and the BJP", this leader was quoted as saying to a veteran senior activist who had close links with a section of Congress leaders. "I expect the Congress to get one third of the assembly seats, around 60, not beyond, unless some miracle happens", he added. Interesting though it may seem, this leader said the same thing in 2012 Gujarat state assembly elections (click HERE). Not without reason, Gandhi’s focus during his two-leg pre-poll visit late last month and early this month, was to "consolidate" Congress' rural and semi-urban, including tribal, base. While he did visit Jamnagar and Rajkot, two major urban centres of Saurashtra region, he avoided public meetings with middle classes in any of the top cities, including Ahmedabad, Surat and Vadodara. Indeed, the view is strong even among independent observers, wanting the Congress to win, that Gujarat leaders' comfort level remains high, despite the fighting spirit it displayed during Ahmed Patel’s Rajya Sabha elections. "They don't know what's happening on the ground. The BJP has launched an all-out offensive to neutralize the discontentment", a grassroots worker said. "Strange things are happening. I saw ONGC virtually distributing scholarships among Gujarat Dalits without any advertisement. And, even those farmers whose crops were not destroyed due to natural calamity are getting insurance money to the tune of Rs 10,000 deposited in their banks", this social worker added. Significantly, these sops are over and above those officially declared to appease the urban middle classes, including traders and small manufacturers, who were showing huge signs of being restive, holding massive demonstrations in Surat and Ahmedabad. Following the Government of India announcing to cut excise duty on petrol and diesel by Rs 2 per litre on October 4, the Gujarat government followed suit reducing value added tax (VAT) on petrol and diesel by 4%, bring down their prices by Rs2.93 and Rs2.72 a litre respectively from Wednesday. Gujarat levied 28.96% VAT on petrol and diesel prior to the tax cut. This was followed by decline in goods and services tax (GST) on several of the items which are manufactured in Gujarat, including khakra, unbranded namkeen (5%), unbranded ayurvedic medicines, manmade yarn (12%), marble and granite, diesel engine parts, and pumps parts. This was followed a new textiles and apparel policy, providing incentives for garment unit owners for “generating” employment by providing subsidy in wages to the tune Rs 4,000 per woman worker, and Rs 3,500 per male worker. The policy also provided interest subsidy, exemption in stamp duty and partial relief in electricity duty. Good assessment, BJP is working overtime while Congress ??? Bribing people and offering sops is all they are doing, not work.